In the middle of a blizzard, eight men and one female prisoner hole up in a cabin on a mountain to wait for the snowstorm to pass. 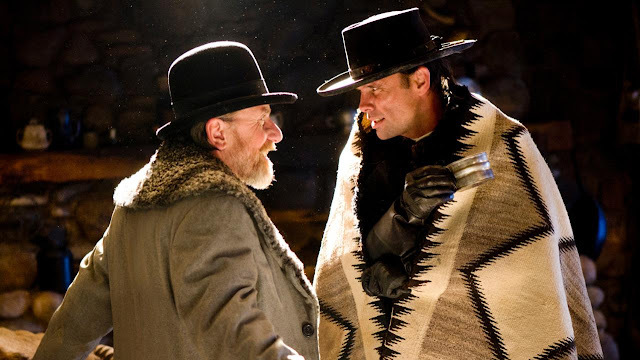 Bounty hunter John Ruth (Kurt Russell) is transporting prisoner Daisy Domergue (Jennifer Jason Leigh) to Red Rock when he picks up Major Marquis Warren (Samuel L. Jackson) and Red Rock’s incoming new sheriff Chris Mannix (Walton Goggins). Arriving at Minnie’s Haberdashery, they meet four other men, some of which may or not be working with Daisy to help her escape. Tarantino clearly doesn't give a flying f**k if you don't like the language in his movies. Most of his characters are pretty nasty bastards, so they're going to talk like bastards. Don't see The Hateful Eight if you aren’t prepared to hear a screenplay full of b***hes and n****rs as every character dispenses with politeness and splashes racist and misogynist abuse up the walls, like Tarantino splashes brains. Therefore, fans of Tarantino will undoubtedly love this. It's talky, it's chronology gets twisted, it's divided into six titled chapters, has opening credits written in big garish yellow letters and its full of sadistic characters just itching to draw buckets of blood from each other. Respect must go to The Walking Dead's Greg Nicotero for providing the brains and bloodshed. The Hateful Eight has six great performances, and despite spending most of the film being defiant in the face of frequent beatings, it is Jennifer Jason Leigh who is undoubtedly the standout when she finally gets let off the chain (literally). Samuel L. Jackson gets the best monologues, but Tim Roth and Walter Goggins share the big laughs that Leigh hasn't already walked off with. The Hateful Eight's ace up its sleeve is not its late-in-the-game Channing Tatum appearance but its post-civil war setting. It's characters are all torn apart by the recent history of America's internal struggle. That's what makes what goes down in Minnie's Haberdashery so strangely topical, even with its period setting. The Hateful Eight are divided by politics, race, gender and who holds the guns and who doesn’t.The cabin is full of resentments and suspicion that still spill onto the streets of America every day. It’s not just the 70mm widescreen that gives the characters space to develop and get a turn at grandstanding. It’s also the three hour running time. Deliberately paced, wonderfully scored by Ennio Morricone and packed with suspense and surprise, The Hateful Eight is Tarantino both staging a bit of a Reservoir Dogs reunion and therefore back to his roots, and also a showcase for how far he’s come as a filmmaker. See it for its range of colourful characters, even if the script sometimes sounds a little like it's been written by a teenager who’s just discovered some very nasty words.